This series focuses on everyday ways we can live our life that are scientifically proven to help the brain. Each week we will see a TED Talk on a given topic and talk about ways to incorporate each aspect. 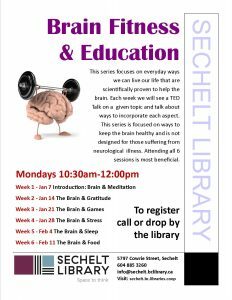 This series is focused on ways to keep the brain healthy and is not designed for those suffering from neurological illness. Week 1 – Jan 7 Introduction: Brain & Meditation ; Week 2 – Jan 14 The Brain & Gratitude ; Week 3 – Jan 21 The Brain & Games ; Week 4 – Jan 28 The Brain & Stress ; Week 5 – Feb 4 The Brain & Sleep ; Week 6 – Feb 11 CANCELLED The Brain & Food. FINAL SESSION DATE TBA. Attending all 6 sessions is most beneficial. Weekly for six weeks, starting January 7th : 10:30 am – 12:00 pm.